I haven't seen it in years, but there was a trailer MGM did for this where Erich von Stroheim as writer of the original story was really emphasized, Leo's promise being greater realism thanks to his input. Considering Von's down/out Hollywood status at the time, it's notable how his name could still summon crowd expectation for blunt content other movies didn't dare, although in this case it was mere sizzle, Between Two Women barely recognizable as Stroheim's, and watered down by Metro staffers in the bargain. The yarn bites deeper still than Kildares or Gillespies that would follow, latters trading on gloss and romance to disadvantage of med issues this at least tries to address. Between Two Women was a one-shot and barometer for Metro hospital stays to come, setting the scene for sickrooms as locus for drama of life and death. 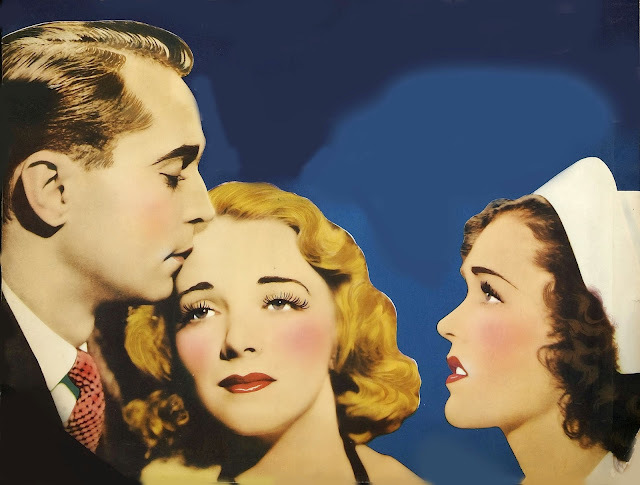 Franchot Tone is the surgeon who's dedicated, nurse assist Maureen O'Sullivan quietly worshipful, while Virginia Bruce society-slums as his short-term wife. Nothing good came of association with idle rich at MGM, but they're everywhere thanks to glamour capital needed, Bruce's character a useful model for fashion even if unsympathetic. It was a cinch, however, that any Metro hero marrying a deb or heiress would come to grief, unless he could somehow "tame" her, or cut ties with Daddy's money (a 30's occupation for Clark Gable after It Happened One Night set the mold).